Fast Duplicate File Finder is the fastest and the most reliable and feature-rich application of its kind on the market. While other tools compare MD5, CRC, size, dates, names and other unreliable properties in order to find duplicates, FDFF performs real byte-to-byte comparison and guarantees that the identified files are 100% duplicates. A new option to Keep Folder Structure while moving files is now added to the application. In the previous versions it was always ON by default. 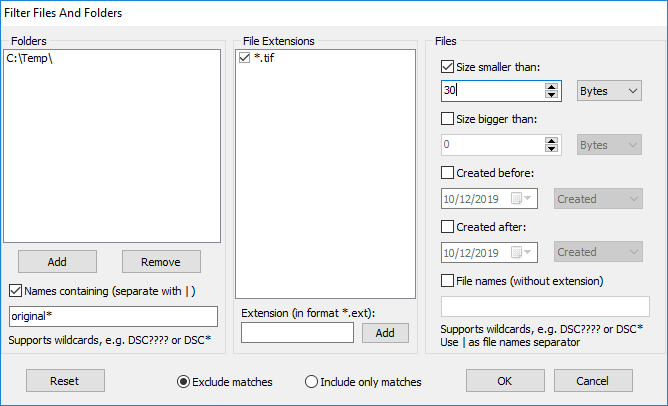 This new feature also takes care of file name conflicts in cases where two or more files with the same name from different locations are moved to the same folder. If the file “report.doc” for example is moved to the same folder from multiple locations the extra copies will be moved with the name “report (1).doc”, “report (2).doc” and so on. Earlier versions of Fast Duplicate File Finder ignored the desktop folders if the “Protection for system files and folders” was enabled in settings. (This option is enabled by default in order to prevent damages to the operating system by novice users). Current version will scan the desktop folders even if that option is enabled as many users store their files on the desktop. In order to prevent damages to the desktops of other user the application will ignore shortcut files which are intentionally duplicated over the desktops of every user. E.g. two different users can have shortcuts to the same applications. This entry was posted in Fast Duplicate File Finder and tagged Best Duplicate File Finder Windows 7 2013, Duplicate File Finder Free, Duplicate File Finder Freeware, Duplicate File Finder Windows 7 64 Bit Free, Duplicate File Finder Windows 7 Free Download, Duplicate File Finder Windows 7 Freeware, Duplicate File Finder Windows Free, Duplicate File Remover Free Download, Duplicate Files Deleter, Easy Duplicate Finder, Fast Duplicate File Finder, Find Duplicate Files Windows 7, Free Duplicate File Finder Download, Free Duplicate File Finder Mac, Free Duplicate File Finder Osx, Free Duplicate File Finder Vista, Free Duplicate File Finder Windows 7 64 Bit, Free Duplicate Finder And Remover, Free Duplicate Finder Excel, Free Duplicate Finder Mac, Free Duplicate Image Finder, Free Duplicate MP3 File Finder, Free Duplicate Mp3 Finder, Free Duplicate Music Finder, Free Duplicate Photo Finder, Free Iphoto Duplicate Finder, Free Mp3 Duplicate Remover, Gemini Duplicate Finder Free, How To Get Rid Of Duplicate Files In Windows 7, Look For Duplicate Files, Microsoft Duplicate File Finder Windows 7, Program To Find Duplicate Files on November 12, 2014 by MindGems Support.